WEST ORANGE, N.J., – With leasing continuing at a brisk pace at The Residences at Edison Lofts in Edison Village, Prism Capital Partners has announced the completion of the next stage of construction at the reimagined Thomas Edison Invention Factory and Commerce Center. The latest unveiling includes additional apartment layouts and amenities at the 21-acre property, located along Main Street in West Orange. The completely reimagined 100-year-old factory building houses a total of 300 studio, one-, two- and three-bedroom units, including 20 penthouse duplex homes to be released in early 2019. 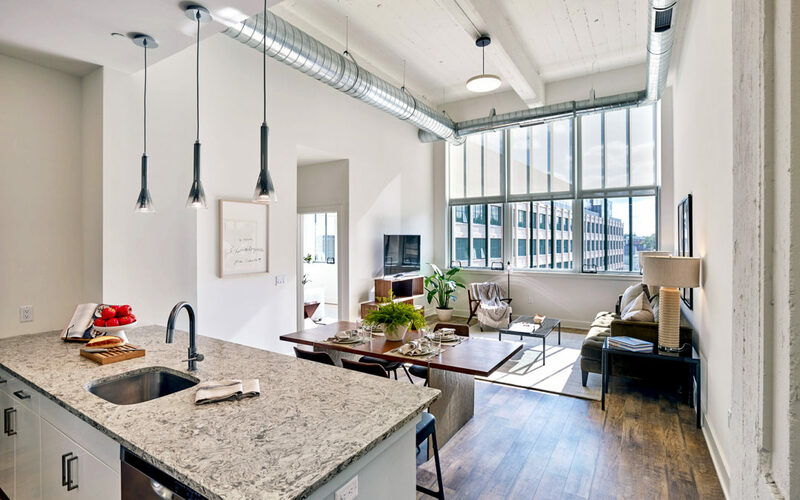 Homes at Edison Lofts take advantage of the building’s existing architectural features, incorporating 14- to 16-foot ceiling heights and 10-foot replica replacement windows. All units feature designer kitchens with stainless steel appliances and luxury bathrooms. Prices begin at $1,795 net rent per month, with the incentive of one month free upfront on a 13-month lease. This newly completed portion of the project houses Edison Lofts’ theatre and media screening room. The community also includes a recently completed, 5,000-square-foot private fitness center, heated indoor pool, sauna, personal and bike storage, private dining room, business center, a dog-washing station and concierge service. A 12,000-square-foot rooftop indoor/outdoor Sky Lounge offers 360-degree unobstructed views of the Manhattan skyline. In addition to the reconstruction of the historic factory building, Edison Village’s Phase I has involved the development of 18,400 square feet of retail, a 630-space parking structure, and The Mews at Edison Lofts, a boutique collection of 34 one- and two-bedroom homes with limited availability remaining. The Edison Lofts leasing center is located at 33 Ashland Avenue and is open seven days per week. For more information, contact 973-327-9748 or Leasing@EdisonLofts.com. Copyright © 2019 Prism Capital Partners.